At the end of 2017, 10 Early Stage Researchers have started on their PhD-journey within the RurAction consortium. RurAction is a H2020-Marie Sklodowska Curie – ITN (GA 721999) in which 10 leading research institutions and 5 social enterprises have joined in order to add knowledge to the intersection of rural development, social innovation and social entrepreneurship research (see http://ruraction.eu). The project is titled Social Entrepreneurship in Structurally Weak Rural Regions: Analysing Innovative Troubleshooters in Action. The RurAction project gives the opportunity to 10 Early Stage Researchers (ESRs) to be trained in both research and practical skills concerning the above mentioned topics. During 36 months we will work on our PhD-thesis and participate in secondments and workshops organised by the consortium. We will conduct comparative research in 7 different European structurally weak rural regions (i.e. Mid-West (Ireland); Sjælland (Denmark); Uckermark (Germany); Pilski (Poland); Mühlviertel (Austria); Phthiotis (Greece); Baixo Alentejo (Portugal)). This complementary approach between research and practice aims to generate a closer understanding of the role of social enterprises when addressing societal challenges in rural areas. Among the ESRs there are nine countries represented and we come from a range of different backgrounds such as economics, sociology, organisational management, architecture, political science and more. We hope that this diversity will prove very beneficial in the success of the project. In this first blog we share the story of our opening conference in Poznan (Poland) and our first seminar in Moura (Portugal). 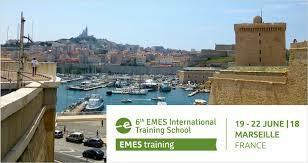 Via the EMES PhD network, we will keep you updated of the process and the results from our projects. Our first get-together was during the international opening conference in Poznan. From 4th – 6th December (2017) an International conference with the topic “Challenges and Opportunities of Structurally Weak Rural Regions in Europe. Social Innovations and Social Enterprises Acting Under Adverse Conditions” was hosted by Adam Mickiewicz University, Poznan (Poland). During 3 days, internationally renowned researchers from different disciplines such as sociology, human and economic geography, political sciences and business studies met up with practitioners from award-winning social enterprises. Presentations of research results stimulated discussion on the role of social enterprises and social innovation in structurally weak rural regions and our understanding of these phenomena. As an example of this necessary complementarity between theory and practice the sessions at Poznan were followed by a field visit to Wągrowiec. This municipality is located in the Pilski subregion – a structurally weak rural region in north-eastern Wielkopolska, 55 km north of Poznań. The municipality of Wągrowiec is a place where social enterprises such as “Common Success” have successfully implemented social innovations. Accompanied by a group of very friendly translators, we had the opportunity to visit one of the workplaces of “Common Succes”. This cooperative aims to empower local people from socially excluded groups (e.g. mentally disabled) through providing training and creating employment in different sectors. Furthermore, there was some time to socialize with the residents of Wągrowiec, who showed us some impressive aspects of their local culture (http://www.wagrowiec.eu/en). The conference marked an inspiring start of our project. Our thanks goes out to the local organisers, Prof. Dr. Tadeusz Stryjakiewicz, Dr. Łukasz Rogowski, Wojciech Dyba and all the volunteers. On the 30th and 31st of January (2018), our first internal seminar took place in Portugal. ADCMoura and the University Institute of Lisbon (ISCTE) hosted us in Moura. ADCMoura is a local development company (https://adcmoura.pt/ ) that is active in the area of Baixo Alentejo (Portugal). The region has to deal with different challenges, amongst others outmigration, an aging population and high unemployment. ADCMoura undertakes and supports a range of different projects cooperate closely with the local vulnerable population such as the roma community, elders, small-scale farmers, etc. to promote territorial development in an integrated and collaborative way. During an interesting field trip, we got to explore the region and some of the initiatives of ADCMoura by ourselves. Together, we discussed our first analysis of the region and the possible solutions to problems we had come across. Since some of us will be back for a secondment at ADCMoura, this provided a great first introduction to the region. During the rest of the seminar, we as ESRs shared our current state of research with each other. Furthermore, ISCTE provided us with some academic inspiration. José Manuel Henriques enlighted us with a historical perspective on social innovation. Maria de Fátima Ferreiro provided us with insights into the increased complexity of problems in rural areas in relation to social innovation. We ended our visit in the lovely village of Monsara. With its idyllic white streets and grand view of the surrounding area, this provided a beautiful decor for our good-bye dinner. All in all, it were two intensive, but very inspiring days. The field trip and the stories of the team at ADCMoura showed us why it is so important that research is done in this field. ADCMoura undertakes great work every day and needs research and policy to help them in their efforts. Our thanks goes out to ISCTE and ADCMoura for providing us with this inspiration. With special thanks to Clara for making us feel so at home! Mara van Twuijver (Ballyhoura Development – UCC) is currently conducting her PhD research into how social entrepreneurs act as trouble shooters in structurally weak, rural regions. For this research, she looks into the entrepreneurial process social entrepreneurs go through and the contextual factors in structurally weak rural regions that influence this process. Lucas Olmedo (UCC) is currently involved, as an Early Stage Resarcher, in an Marie-Curie project (RurAction) which main purpose is to develop intersectional knowledge in the fields of social innovations and social entrepreneurship in rural regions. A Ph.D. journey: Lauren’s testimonial.